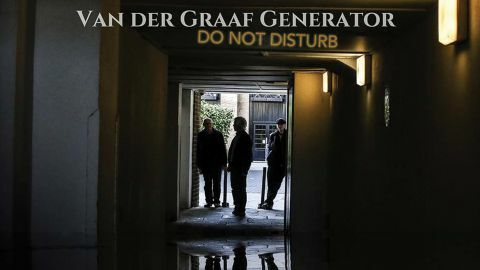 If, as Peter Hammill has indicated, this is the last Van der Graaf album, these winners of Prog’s Lifetime Achievement award this year are going out with the kind of mind-joltingly gorgeous roller coaster that made them one of the greatest genuinely progressive bands of all time. But there’s also a noticeably reflective aura and sense of closure around their 13th album, which came about by Hammill sending organist Hugh Banton and drummer Guy Evans a CD of the new songs, which they spent a week rehearsing, another week recording backing tracks, then six months overdubbing and tweaking at their home studios. The album is a mind-joltingly gorgeous roller coaster. Opening track Aloft starts with Hammill’s gently strummed guitar and the ghostly banks of overdubbed vocals he turned into a fine art years ago, before Evans and Banton crank into the first of several convoluted time signature stretches and one of those magnificently malevolent riffs they do so well. Alfa Berliner begins as the kind of Refugees-style ballad that provided calm between the electric storms, then erupts midway. ‘We were recklessly alive!’ declares Hammill, whose grizzled guitar plays an unusually prominent role throughout the album, notably on the metal rifferama of the outrageously mischievous (Oh No I Must Have Said) Yes. Here Hammill’s abrasive howl recalls his punk-predicting alter ego Rikki Nadir, before the group suddenly switch to a finger-snapping jazzy nightclub vamp, then return to the riff like nothing has happened. Brought To Book is this album’s epic, Hammill crooning ‘all that’s done is done’ before the riffs swarm in like a meteor shower. Despite the bonkers interludes, much of the album sounds more measured than the psychotic maelstroms of yore, almost like a chamber version of the VdGG sound, which is incredibly powerful in its own subtle way. Since that fateful night in late 1969 when this writer first saw Van der Graaf grip a crowd with their scurrilous roar and heart-spiralling slowies, they have been an essential life component. Even when the name temporarily retired and Hammill continued spurting the startling solo works, it felt like they were still there. Lyrically, there seems no turning back now, especially after closing track Go. It’s hard not to well up as, over fragile church organ, he softly intones ‘It’s time to leave… It’s time to let go…’ Maybe it is for them, but not for the thousands who truly love this band and will carry on playing those endlessly rewarding albums. We can only thank Van der Graaf for the glorious memories and towering music, such as this last proud statement.